Introduction: Why a verse novel? First of all, thanks for showing an interest in New Found Land: Lewis and Clark’s Voyage of Discovery. To me publishing a book is one of the most personally gratifying of human achievements. But even more gratifying is publishing a book that someone else actually reads. So thanks. As a poet I am drawn to this form for the same reasons that as a child I was drawn to poetry. I like how the snippets of the narrative emerge and fall into place as if I am reading a jig-saw puzzle. And I have an innate love of how lines of verse turn. Their shape is not mandated by the dimensions of the book’s page. Their shape is determined by something more mysterious, some sort of magic that comes from the words themselves. These line breaks are a constant graphic reminder that the words have been worked by the hands of man, like taking in the sight of a freshly ploughed field. The intentional furrows are a testimony to human ingenuity. To read a verse novel is to watch the words of the story turned into furrows, the lines emerging in the wake of a tiny invisible plough. What better medium could there be to relate the story of Lewis and Clark’s Herculean struggle to inch their way across the continent and back ? Supplies which did not run out: Guns, powder, lead, paper, and ink. • Read the quotation that opens New Found Land. (It comes from a novel by Marcel Proust (1871-1922), titled Remembrance of Things Past.) “The real voyage of discovery consists not in seeking new landscapes, but in having new eyes.” Discuss how the Proust quotation sets an appropriate tone for the book. 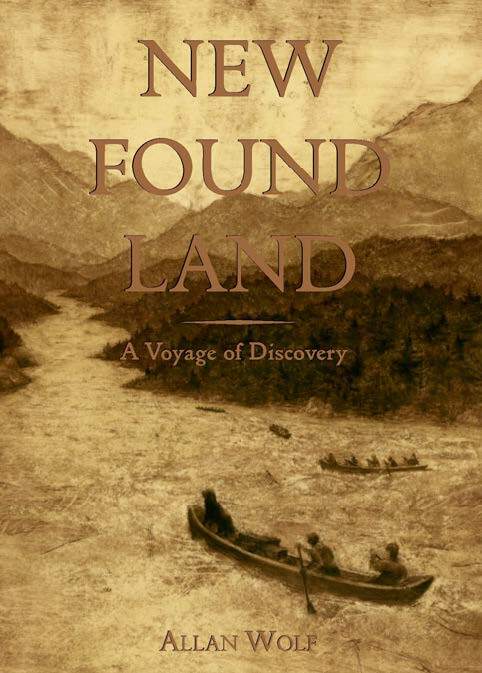 • New Found Land is really the stories of fourteen separate voyages woven into one, just as strips of elk-hide can be woven together to make a strong continuous rope. Discuss what each character is attempting to discover. Which characters succeed and which characters fail? • Which of the book’s characters is your favorite? Why? • Even though Oolum, the book’s narrator, seems wiser than the humans around him, he still has a few things to learn. Discuss the dog’s strength’s and weaknesses. • Oolum, the Newfoundland, acts as a symbolic foil to his human counter parts. He also acts as a handy narrative device to help explain a lot of factual information regarding the history of the expedition. Discuss how the book would be different without the dog’s presence. • Discuss the book’s format. Is it poetry? Is it prose? Is it a script? Is it a novel? Just what the heck is it anyway? Do you feel the format is appropriate? • Many of the pieces in New Found Land end with a detail or a turn of phrase that links it to the opening lines of the piece that follows. This helps the various narratives to flow together. Some transitions were carefully planned while others just happened by themselves. Some are very obvious, while others are more subtle. See how many of these transitions you can find. • New Found Land contains countless biblical references and ideas—Noah, Adam and Eve, Paradise, the keelboat floating upon Angel feathers, Sacagawea appearing above the water. The pilgrimage. The return from the wilderness. The countless tests of physical and spiritual endurance. The book is divided into seven sections mirroring the Biblical creation story. Even Sacagawea and little Pomp seem to act as Madonna and child. Discuss how these images all work together. Can you find others? • Discuss the relevance of the book’s main title, New Found Land. Clark is famous for both. Students go on an “expedition” in search of images, details, and words, writing in their “field notebooks” as they explore. Sensory description is encouraged. Complete sentences need not apply. Images can be arranged as a chronological list or as a scattered montage. Have students do it daily. The best way to assure this is to do it in class. Drop everything and write. Teachers and librarians should do this as well. Write with them. Word cluster (alone, pair share, teams, class) around general topic words (Discovery, Expedition, River, Water travel, boat terms, etc). This allows students to display prior knowledge and establishes studentcentered vocabulary lists. Create a celebration tree to which students can sign their names just as Corps members signed their own names at the Pacific Ocean. All students like to make maps. Maps can be real (the classroom, library, or school grounds) or imaginary (the bizarre sights Lewis and Clark might have found in a fantasy or sci-fi book). Be sure to include a legend and show which way is North. Students name and describe an animal or object as if it has never been seen before. (See Field Observation Sheet). Advanced students can create their own scientific Linnaean names. After explaining the story of Patrick Gass having to plead his case at Fort Kaskaskia, have students compile a list of skills that they can contribute to your own classroom adventure of learning. Ask them also to state why they want to go on this journey of learning. What are their goals and objectives? What is it they hope to discover? Then have each student write a short persuasive piece. Some of Lewis and Clark’s journal entries make excellent writing prompts. Students can simply respond in a free form way to what they’ve read. Students can also put themselves in Lewis and Clark’s shoes and write their own versions. Lewis’s birthday reflections August 18, 1805. After reading this passage, students write their own. What accomplishments do they take pride in? What regrets do they have? What goal would they like to set for the coming year(s)? Clark’s excited entry of November 7, 1805. “Ocian in view! O the joy!” Students reflect on the moment that they accomplished a hard won goal, explaining all the steps they took to reach the end. This is a great way to assess what your students have learned. You give them a “test” in the form of a quiz game show, only the questions are mostly generated by the students themselves. Have students come up with two or more questions alone or in pairs, writing each question and its answer on a slip of paper that you provide. Students should write their name(s) on these questions. After you’ve gathered up the questions, divide the class into teams, giving each team a name (Team Clark, Team Lewis, Team Cruzatte, etc). You then play MC. Questions should be directed at individual students who can opt to answer the question alone or seek the help of their team. This is really fun. I usually come to class with a few of my own questions to mix in. I got this idea from author Michael Shoulders and the alphabet book series by Sleeping Bear Press. As a way of summing up what your students have learned, have them write a Lewis and Clark ABC book. A is Adventure. B is for Boat. C is Clark who was a Co-Captain. N is for Newfoundland dog. etc. Each short sentence can be accompanied by a more in-depth paragraph. Students can work on each letter, generating text and illustrations, separately or in teams. Make your own puzzle using vocabulary words and/or highlights from all you’ve learned in class. Each student should be given his or her own puzzle piece (with name written on it). This is great for a “graduation ceremony.” All students then work together to construct the puzzle and see what is written there. What does it eat? How does it move? What does it do? • Inspire excellence by acting as role model. • Involve community members in decision making. • Determine members’ talents and use them. • Team-teaching is a good idea. • When preparing for a long voyage, gather ample supplies. • Don’t forget the food. • If you want to attract customers, learn what they’re into and get it. • Always, always, always keep your gun loaded. • Think out of the box; improvisation is your friend. • Don’t be afraid to spend your own money. • The best way is not always the quickest way. • Initiate a no-spelling zone. • If you write it down, it will not be lost. • To write history is to make history. • Form a writing habit. • How did Lewis and Clark write 2,000,000 words? EVERYDAY! • Writing helps you get somewhere. • Always carry a field notebook. • In order to write one book, you must read many. • To be a writer you must be a reader. • It takes 40 gallons of sap to make one gallon of syrup. • Lewis and Clark embraced the Unknown. • Lewis and Clark applied their previous knowledge to explore the unknown. • I got the idea to write about Lewis and Clark from Bob Falls at Poetry Alive! Bob, who is an avid reader and historian, told me the story of Lewis committing suicide. Bob also mentioned that the bicentennial was just around the corner. I knew little to nothing about Lewis and Clark, but Lewis’s suicide intrigued me. And the bicentennial meant that the topic would be in the news which would be good for book sales. I didn’t finish researching and writing the book until four years later! • I wrote most of the book on the second floor of Ramsey Library at UNC-Asheville. I wrote the first draft in two different 8-week periods of intensive writing. I would begin around 9 or 10 AM and write until they closed the library at 11:00 PM. After writing seven days a week for 2 months the first half was done. After a break I spent another two months writing the last half. • During the course of my research I wrote pages and pages and pages of notes. I wrote an extensive annotated bibliography. I created my own detailed timeline of events combining all my fictional elements with the historical ones. I spent weeks researching details that I later wouldn’t even use. I wrote an earlier version in a straight prose form that I scrapped. • I read countless books. I had to drive to a library an hour away to check out and return the most recent edition of the Journals. The Journals themselves are in 13 volumes. There were related documents and letters to read and an endless supply of books (very good and very bad) about Lewis and Clark to wade through. I read history books using two book marks, one for normal reading and one for the endnotes. I read books about buffalo, Newfoundland dogs, Indian nations, sign language, fiddles, water navigation, geography, teepees, flintlock rifles, suicide, Pittsburgh, diapers, the White House, Thomas Jefferson, 17th Century underwear, and on and on and on. • I knew from the very beginning that the book would be titled New Found Land. You might say that the title was the acorn from which the mighty oak grew. The title and the basic concept struck me like a thunder clap as I was flying from Boston to Asheville. In my mind was the image of a dog’s piercing eye. I wanted to call it simply New Found Land or at most New Found Land: A Voyage of Discovery. The publisher insisted on the final subtitle: Lewis and Clark’s Voyage of Discovery. With “Lewis and Clark” in the title, the book is more “searchable.” Ah, me. • The supernatural powers of Oolum, the Newfoundland dog, began very strong, but lessened as I developed and revised the story. Initially each character would look into the dog’s eyes and see the details of his or her eventual fate. This was just a bit too “Twilight Zone” and plus Candlewick Press had recently published another novel starring a wolf with that same power. • When I came up with the concept of the dog as narrator, I thought I was pretty clever. Then I found a published book that had already done it. After that it seemed like every month or so, a new Lewis and Clark book would come out, each one starring the dog. Every published book was like another knife in my gut. Perhaps I hadn’t been so clever after all! • One of my favorite transitions contains a subtle joke on my part. Oolum explains at the end of Page 380 how the men’s fibrous diet had filled them “so full of wind that they could scarcely breath!” The piece immediately following is narrated by—who else?—Patrick Gass. • Somewhere in the book is a line I stole directly from Carl Sandburg’s epic poem The People, Yes. The line is “Where to now? What next?” Can you find it? • I made up the name of the builder of the keelboat. If his real name exists, I have not yet found it. I called him Noah as a joke, since Lewis’s boat was so long in being built and there was a record drought on at the time. • All of Pierre Cruzatte’s songs are my original work. “Roll-on, Roll-on” is based on a real boatman’s ditty. “Oh, Weary Sun Go Down” which Cruzatte sings at Charles Floyd’s funeral is based on the Appalachian sacred tunes I’ve heard. The “Latitude and Longitude” song, although funny, comes at a dangerous moment in the journey where to follow the wrong branch of the river could cost the men their lives. All the lyrics have tunes. • I had to draw original mock-ups of all the book’s six maps from which Canadian artist Malcolm Cullin painted the final versions in watercolor. • The cover art consists of two original paintings by Max Grafe commissioned specifically for New Found Land. The front cover depicts the Corps’ navigating the choppy water of the Clearwater River, just before entering the Columbia. Betts, Robert B. In Search of York: The Slave Who Went to the Pacific with Lewis and Clark. Revised Edition. Boulder: The University Press of Colorado, 2000. Chuinard, Eldon G. Only One Man Died: The Medical Aspects of the Lewis and Clark Expedition. Glendale, CA: Arthur H. Clark, 1979. Clarke, Charles G. The Men of the Lewis & Clark Expedition: A Biographical Roster of the Fifty-One Members and a Composite Diary of Their Activities from All Known Sources. Lincoln: University of Nebraska Press, 1970. Bison Books Edition, with Introduction by Dayton Duncan, 2002. Cutright, Paul Russell. Lewis & Clark: Pioneering Naturalists. Urbana: University of Illinois Press, 1969 (reprinted by University of Nebraska, 1989). Holmberg, James J. Dear Brother: Letters of William Clark to Jonathan Clark. New Haven: Yale University Press, 2002. Jackson, Donald, ed. Letters of the Lewis and Clark Expedition with Related Documents, 1783-1854. 2nd ed. 2 vols. Urbana: University of Illinois Press, 1978. Moore, Robert J. and Michael Haynes. Tailor Made, Trail Worn: Army Life, Clothing, and Weapons of the Corps of Discovery. Helena, Montana: Farcountry Press, 2003. Moulton, Gary, ed. The Journals of the Lewis & Clark Expedition. Lincoln: University of Nebraska Press, 1988-2001. Thirteen Volumes. *Moulton, Gary, ed. The Lewis and Clark Journals: An American Epic of Discovery. Lincoln: University of Nebraska Press, 2003. One volume. Ronda, James P. Lewis and Clark Among the Indians. Lincoln: University of Nebraska Press, 1984. Bison Books, 1988. Saindon, Robert A., ed. Explorations Into the World of Lewis & Clark: Essays from the Pages of We Proceeded On, the Quarterly Journal of the Lewis and Clark Trail Heritage Foundation. Scituate, MA: Digital Scanning, Inc., 2003. Three volumes. Adler, David A. A Picture Book of Sacagawea. Ill. by Dan Brown. New York: Holiday House, 2000. Bruchac, Joseph. Sacajawea: The Story of Bird Woman and the Lewis and Clark Expedition. San Diego: Silver Whistle, 2000. Blumberg, Rhoda. York’s Adventures with Lewis and Clark: An African-American’s Part in the Great Expedition. New York: HarperCollins, 2005. Gragg, Rod. Lewis and Clark on the Trail of Discovery: A Museum in a Book. Nashville: Rutledge Hill Press, 2003. Herbert, Janis. Lewis and Clark for Kids: Their Journey of Discovery with 21 Activities. Chicago: Chicago Review Press, 2000. Johmann, Carol A. The Lewis & Clark Expedition: Join the Corps of Discovery to Explore Uncharted Territory. Charlotte, VT: Williamson Publishing, 2003. Karwoski, Gail Langer. Seaman: The Dog Who Explored the West with Lewis & Clark. Atlanta: Peachtree Publishers, Ltd., 1999. Patent, Dorothy Hinshaw. Plants on the Trail with Lewis and Clark. Photos by William Muñoz. Clarion Books, 2003. _____________ . Animals on the Trail with Lewis and Clark. Photos by William Muñoz. Clarion Books, 2002. _____________. The Lewis and Clark Trail: Then and Now. . Photos by William Muñoz. New York: Dutton Children’s Books, 2002. Pringle, Laurence P. Dog of Discovery: A Newfoundland’s Adventures with Lewis and Clark. Honesdale, PA: Boyds Mills Press, 2002. Redmond, Shirley-Raye. Lewis and Clark: A Prairie Dog for the President. New York: Random House Children’s Books, 2003. (Easy Reader). Smith, Roland. The Captain’s Dog: My Journey with the Lewis and Clark Tribe. San Diego: Gulliver Books, 1999. Tunis, Edwin. Frontier Living. Cleveland: The World Publishing Company, 1961. Wolf, Allan. New Found Land: Lewis and Clark’s Voyage of Discovery. Cambridge: Candlewick Press, 2004. Lewis & Clark: The Journey of the Corps of Discovery, a film by Ken Burns, Florentine Films and WETA-TV, produced by Ken Burns and Dayton Duncan, 4 hours, PBS Home Video, 1997. On Video and DVD. † Writing Poems by Robert Wallace (Little, Brown and Company, 1982), page 8. I cut my teeth on this great book in graduate school. It’s a must for any serious poet.